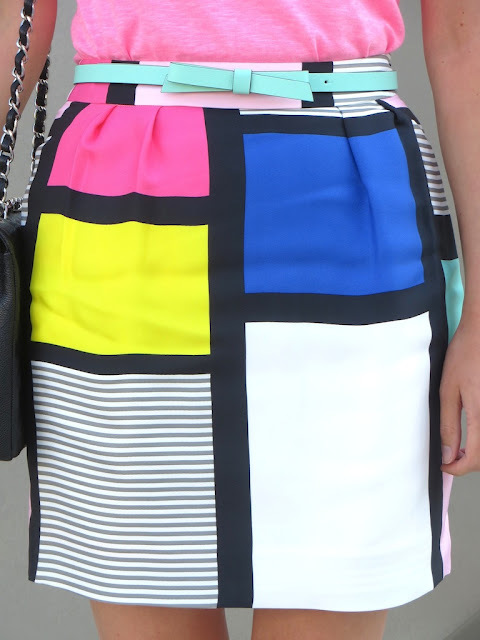 I am a sucker for anything that is inspired by art and the Kate Spade Mondrian "Barry" skirt definitely fits the bill. In fact, the artist's name is right in the product title. While Mondrian worked in primary colors, Kate Spade used her artistic licence to add a pop art spin to the skirt, infusing it with pinks and a pastel mint color. This skirt was on my "must buy" list for the last few months, but I was a bit dismayed to find that the skirt was made of viscose as opposed to silk or organic fabric. (I guess that adds a little bit of a futuristic feel to it?) Well, when I found the skirt on eBay for a price that was cheaper than the Kate Spade "pop up" sale price, I decided to pull the trigger. While the skirt came new with tags, in the original KS packaging, it was stuffed into a teeny tiny envelope. Needless to say it was one wrinkled Mondrian. I read online that if you don't have a steamer (which strangely enough I had in college, but not now) you can create your own steamer by taking a hot shower and hanging the article of clothing in the bathroom. I tried this and it worked wonders for my skirt. Sadly, it did get a little wrinkled on the car ride to Downtown LA and then even more so during dinner. It was back in the shower for my Mondrian the next day! If you couldn't tell from the staircase, I am actually at Disney Hall in these photos. Disney Hall was designed by architect Frank Gehry and it's where you will hear the LA Phil play their melodic melodies. I feel like the pop of silver in my J. Crew Lillian wedges in "Mirror" aka silver suited the massive chrome structure that is Disney Hall. I'm sort of on the fence about how I feel about Disney Hall aesthetically speaking. It is both beautiful and hideous at the same time. The acoustics are great though, and that is what counts most. It's not the season yet for the LA Phil as they take a hiatus during summer months and instead play at the Hollywood Bowl. Instead of taking in a concert, our real motive for venturing again to Downtown LA was to dine at Patina restaurant, which is located in Disney Hall. 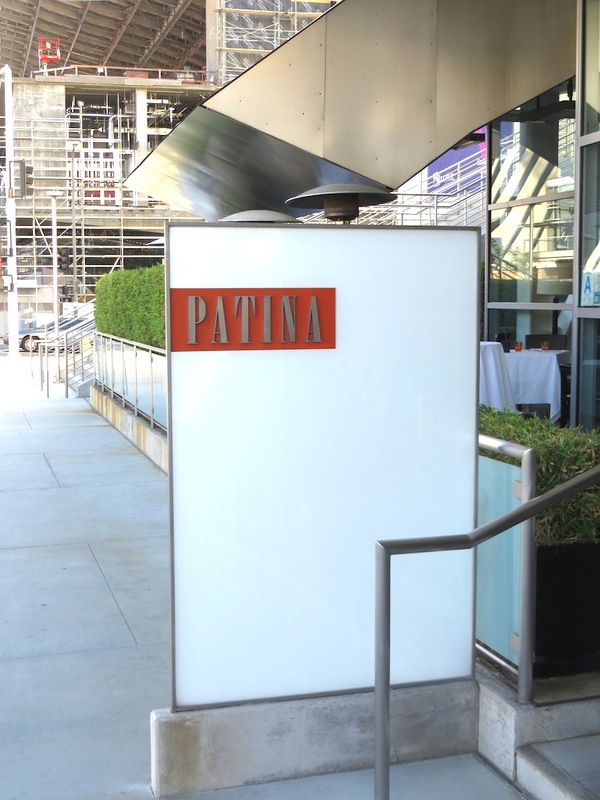 While it sounds crass to say, the food at Patina was yummy and a visual feast for the eyes, truly works of art you can eat. My favorite dish, aesthetically speaking, was my husbands appetizer which was Hawaiian Kampachi. I don't eat fish, so I don't know how it tasted, but he said it was very good. I opted for the "pigs in the blanket" appetizer. I've never had traditional pigs in a blanket because I don't like hot dogs, but this wasn't your typical pig in a blanket. Instead it consisted of a chicken sausage wrapped in brioche with a miso sauce. Somehow the combination of disparate flavors and these tiny mushrooms was absolutely delightful! Our main courses, Kobe beef for me and salmon for my husband, were also very good, but less visually interesting so I've decided not to include pictures of them. Nice skirt! I've yet to try the steamming via bathroom method, but it's good to know that it ACTUALLY works! Btw, I had my eyes on those J Crew wedges you're wearing. They weren't as comfortable as I'd like them to be though, so I didn't bother finding a pair for less. How's it working out for you? I've only worn the Lillian wedges a couple times and I haven't walked a great deal in them, but I actually find them super comfy. It usually takes me a while to break in new shoes, but not with these. ooooh katie this outfit is gorgeous! and you used one of my favorite words... hideous. bwahahha. your dinner looks delicious! Thanks Laura ! Yes, hideous is sort of a fun sounding word, but hopefully I won't have to use it too much!